Limoncello is an Italian lemon liqueur mainly produced in Southern Italy, especially in the region around the Gulf of Naples, the Sorrentine Peninsula and the coast of Amalfi and islands of Procida, Ischia and Capri. I use about 20 lemons, 6 cups of sugar, 2- 1.75 liter bottles of vodka, 2 c water. Carefully peel lemons without getting the white part; squeeze lemons in a saucepan, add the water and sugar, simmer until sugar dissolves. Place vodka, lemon peel, and simple syrup in a large glass container. Put jar in a cool, dark place for at least a month, and up to 3 months. 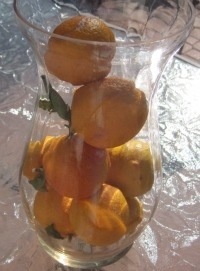 Remove lemon peel, pour into bottles and place in freezer before serving or gifting. A nice twist ( I did this for the one at the cookout) – add a split vanilla bean with the lemon peel.